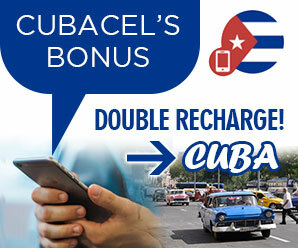 cubacayosantamaria.com | Want to know before you go? 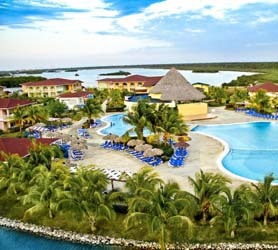 Official Cuba Cayo Santa Maria information and guide, get facts and latest news. The Catamaran Cruise from Cayo Santa Maria is sold at all hotel receptions and costs 79 CUC for adults and 36 CUC for children. A bus comes to collect you at your hotel and take you to the marina which is only 10 minutes away. 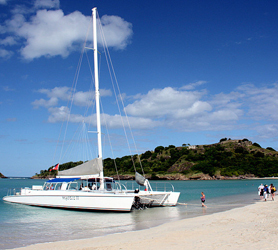 The catamaran cruise is great fun and offers a fantastic experience as it visits neighboring islands, islets small keys. 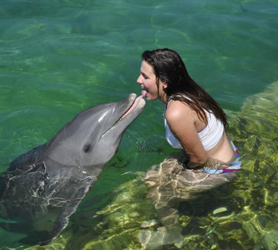 Dolphin’s frequently join the boat and play in its frontal wake, quite a spectacle! The cruise takes you past the American San Pascual ship, close to Cayo Santa Maria, which ran aground. During the Ernest Hemingway years, she served as stranded hotel, resting on the seabed. Then, in the late ’90s, the ship was revitalized and her 10 cabins, bar and restaurant were brought back from the brink and put into service as a scuba diving hotel. Today she is just empty. Snorkeling is offered near a small key, just above the vibrant reef below, where you can dive into the warm and transparent waters to see some of the sea life, coral and vibrantly colored fish on the second biggest coral reef of the world. There is beach time in a secluded virgin beach where a lobster or chicken lunch is served. The price includes an open bar and music during the journey. The Cayo Santa Maria Catamaran Cruise starts at 9:00 am till 4:30 pm and is well worth the price and great for the whole family. 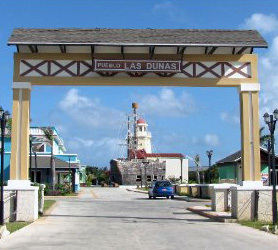 Caibarien is small city with a population of 38,000 located at the start of the causeway between the mainland and Cayo Santa Maria. 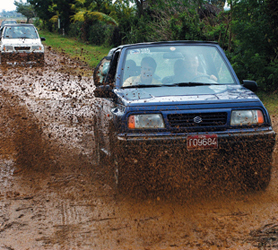 Since the city is just 48km from the island it’s a popular day-trip and excursion destination. Primarily a fishing town it is also the main port for the province of Villa Clara. Caibarien was founded in 1832 from a map designed by Estratón Bauza. In 1878 the town already had stores, churches, schools and newspapers. Caibarien, despite being a small city it has its own Caibarien Airport (ICAO) and provides for some distinctive 19th century colonial architecture. Caibarien is also known as “La Villa Blanca” (The White Town), the locals say this name stands for its sands and beaches. Caibarien is famous for its “Parrandas” (Carnivals) along with the neighboring Remedios located 7 kilometres (4.3 mi) west of the city. Many of Caibarien´s buildings have fine wooden porches with a distinctly French influence, and some are pretty grand properties. Life movies slowly in the city with a fair number of horses in town, either with single riders or carts. The sidewalks are ornate affairs made of large stone slabs set in concrete. Caibarien has little in the way of tourism, meaning visitors can wander around unhindered by hustlers. The highlight of the city is the Malecón which is lined with abundant warehouses originally used during the 19th century for storing sugar cane, most of which are being renovated to accommodate a new fishing zone in the east with a new road, coconut palms and several cool bars and cafés where visitors can sit and admire the view. 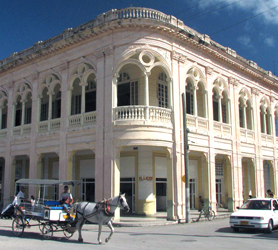 The main epicenter of the town is a large square, with an 1850 church and the impressive neoclassical Lyceo (1926), where the Museo Municipal de Caibarién María Escobar Laredo, can be found on the second floor. You’ll find permanent and temporary exhibitions, including the furniture previously owned by María Escobar Laredo, who was one of the founders for the city. The elaborate gazebo in the center of the main plaza was built in 1915, the largest in Cuba and famous for its excellent acoustics. If you’re in-town you can see some concerts by local bands on Thursday and Sunday nights. Also on the plaza is a store called London City, which was, during the first decade of the 20th century, a custom-made tailor’s store. Interestingly, much of the local culture is influenced by slavery and African traditions. Like Remedios, Caibarién also has its colorful carnivals called parrandas. Caibarien is the place to be on Christmas Eve when a non-religious celebration is held, first held in 1892 it is said to have begun with the banging of a drum by a 110 year old former slave called Juan de Jimagua. People from the city then followed him plus many other conga players around the town, a tradition still popular today. Cayo Conuco is a tiny island located 7 kilometers (4 miles) from Caibarien which is joined to the mainland by a stone causeway, the island is a weekend retreat for beach goers from the local community and can be quite fun. Cayo Conuco is biosphere reserve with lots of flora and fauna, and a campsite. You’ll find the ruins of a former cholera hospital, erected by the slaves in the 19th century to quarantine victims of the devastating disease. The island of Cayo Santa Maria, Cuba has an area of 13 km²or 8 miles², one of the smallest in the Jardines del Rey Archipelago is under jurisdiction of the Villa Clara Province. Jardines del Rey are part of a collection of various islands on the north coast of Cuba. 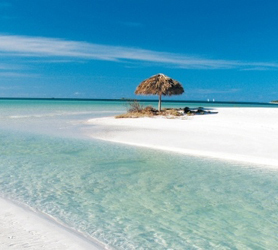 Cayo Santa Maria is 60km from Cuba’s north coast city of Caibarien and getting to the island is via a causeway called the pedraplen. The journey takes about 50 minutes by car. On the coast of the Atlantic Ocean, the entire archipelago where Cayo Santa Maria is situated includes +2,500 keys and islets straddling the four provinces of Villa Clara, Matanzas, Ciego de Avila and Camaguey. 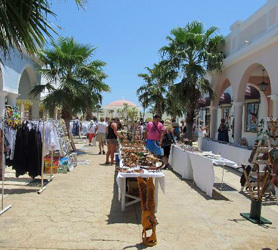 The first tourist development on the Jardines Del Rey Islands began in the 1990s, on Cayo Guillermo, with the inauguration in 1992 of the Club Villa Cojimar Hotel (now the Hotel Allegro), next came Cayo Coco a year later with the Hotel Guitart Cayo Coco (now the Hotel Colonial). Since there were no commercial airports on the islands in the 1990s, the Cuban tourism authorities resorted to using the Maximo Gomez airport located in the provincial capital of Ciego de Avila and later built the Las Brujas Airport (BWW) which now serves Cayo Santa Maria. The construction of the pedraplen causeway from the mainland began in 1988 and was completed 10 years later in 1998, its 48kms (29 miles) length connecting Cayo Santa, with it began the explosion of tourism on the latest tourism destination of the King’s Gardens. A 38 kilometers causeway was later constructed to connect Cayo Santa Maria with Cayo Las Brujas. Cayo Santa Maria is 395 Km (245 miles) from Havana. Varadero is 315 km (195 miles) from Cayo Santa Maria, whereas the closest cities to Cayo Santa Maria are Caibarien (population of 38,200) at 60km (37 miles) and Remedios (population of 46,500) at 68 km (42 miles). The biggest major city is of course Santa Clara (population of 220,000) 115 km (71 Miles). The United States of America is not far from Cayo Santa Maria, with Miami Florida at just 288 miles (464 kilometers) by flight from Cayo Santa Maria in Jardines del Rey Cuba. Though there are no direct flights, to get an idea of just how close Cayo Santa Maria in Cuba is to The Turks and Caicos, the JAGS McCartney International Airport (GDT) in the Turks and Caicos Islands is just 804 km (499 miles) from the Las Brujas Airport (BWW) in Cuba. Posted in Where is Cayo Santa Maria? | Tags Cayo Santa Maria Location, Distance Caibarien Cayo Santa Maria, Distance Havana Cayo Santa Maria, Distance Trinidad Cayo Santa Maria, Distance Varadero Cayo Santa Maria, Where is Cayo Santa Maria Located? Hotel Playa Coco Cayo Santa Maria features 769 sumptuous rooms distributed over low level 3 storey resort and vast beachfront location. Each room provides impressive views overlooking the turquoise sea, beach, pool or the garden. Hotel Playa Coco Cayo Santa Maria is an all-inclusive 5 star luxury resort managed by the prestigious hotel chain of Gaviota. Featuring several separate buffet offers plus special dinner arrangements at the resorts intimate a-la-carte restaurants. Hotel Playa Coco Cayo boast its own onsite Spa and gym which lead out to sun loungers and parasols by the pool for a rest after your pampering or workout. The kids club features daytime activities around the kids special pool and also unique ecological excursions to discover and learn about Cuba’s rich wildlife. Nighttime entertainment includes traditional Cuban bands and live performances. Free introductory scuba lessons are included for all guests in the pool and those who wish can then take a dive or two on the world’s second largest coral reef of Jardines del Rey. Our booking process is unique because it shows the best rate from all of these for Playa Cayo hotel in Cayo Santa Maria and the types of rooms available. 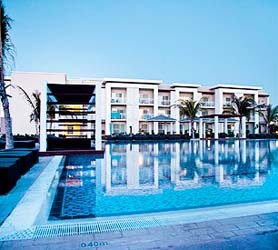 Our Playa Cayo Cayo Santa Maria rate comparison is an industry first for Cuban Hotels. Once you’ve compared the rates, finalizing the booking at Playa Cayo Hotel takes just seconds and an immediate confirmation is provided in real-time. Memories Paraiso Cayo Santa Maria is located in the center of Cayo Santa Maria, Cuba and encircles by lush tropical gardens, white sandy beaches, and turquoise Caribbean seas. The all inclusive Memories Paraiso Cayo Santa Maria Beach Resort as modeled after Spanish colonial design, making this beautiful vacation hideaway both stunning and picturesque. Memories Paraiso Cayo Santa Maria is an all suite resort, meaning all rooms are large and feature rich wood furnishings and classic styles throughout. The enormous balconies offer breathtaking views of the tranquil gardens and sparkling Caribbean Sea. Numerous dining options are offered with several different buffet areas along with intimate à la carte restaurants featuring international cuisine. Our booking process is unique because it shows the best rate from all of these for Memories Paraiso hotel in Cayo Santa Maria and the types of rooms available. Our Memories Paraiso Cayo Santa Maria rate comparison is an industry first for Cuban Hotels. Once you’ve compared the rates, finalizing the booking at Memories Paraiso Hotel takes just seconds and an immediate confirmation is provided in real-time.